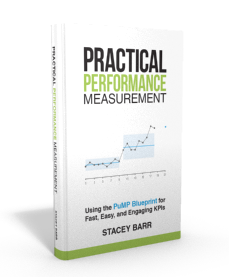 Has Your Measure Become The Goal? In response to last week’s blog post, about not fixating on outliers, Martin Klubeck, author of Metrics: How to Improve Key Business Results, reminds us just how easy it is to fall into the trap of making our measures the end goal, and why we must make sure we stay connected with our intended results. Recently I had the privilege of speaking to a group of researchers about the metrics-related things that drive me crazy. One of my major issues lies with the metamorphosis that I see a lot. We start off with a solid, well-written, meaningful goal. Like, “creating a strong followership” for a newsletter. Stacey’s recent post about not fixating on outliers drives it home. Her goal may have been to build a solid followership and one of her measures of success could be the unsubscribe rate. As an indicator this would be great. The problem occurs when the user of the measure decides to go with just the one measure. Instead of looking at other important indicators like new subscribers, activity levels (how many comments do the posts generate? ), and referrals – I see a lot of people fall into the mistake of focusing on just one measure. Most times this results in a metamorphosis. The goal ceases to exist and instead we chase the number of unsubscribes. We focus not only on the outliers Stacey mentioned, but we also fixate on how many there are. Our goal of building a followership deteriorates into decreasing the number of unsubscribes. I have heard many well-meaning managers tell me in all sincerity that they don’t see what’s wrong with focusing on the numbers. I have to point out that their well-written goal has morphed into a simple target or threshold. Instead of trying to build a followership, all they care about is keeping the number of unsubscribes down. Do you find that your goals are morphing into measures? Do you have any measures that have become more important than the thing they were designed to provide insight to? Has your indicator become the goal? Yes! Yes! Yes! If something is not measured by an organization then it doesn’t exit, in my experience as someone working with numbers for over 40 years. We need to use “And” instead of “or”. Accountants know how impossible it is to go back and get information that is not tracked. That is why the chart of accounts is so large in many companies. There are some that are hardly looked at and others get watched day and night. See this article about measuring recidivism in CA that is of interest to me as board chair of Uplifting People, a NFP helping to keep people from going back to prison in Georgia (USA).